Annnnnnnyway. 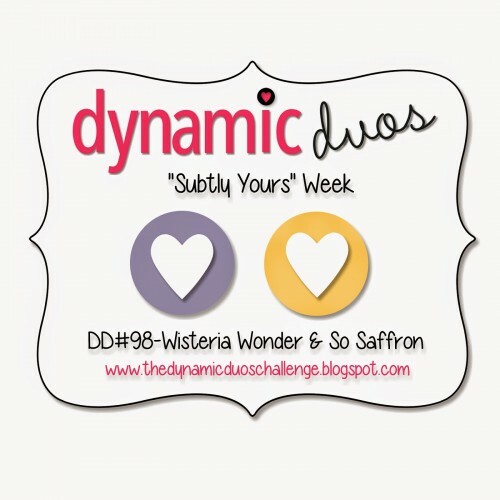 It’s Subtly Yours Week over at Dynamic Duos, also known as Sarah Stares at Her Supplies for Six Days Week. I am just not good with subtle colors! I couldn’t even do my nursery in pastels when I was pregnant with my daughter. Bold colors all around. The above card is actually the second card I made. First I made this one. Hated it. It’s grown on me, but it’s not my style, way out of my comfort zone, etc. But I will tell you how I made it, and then I’ll tell you about the other one. For the vintage card, I started with the Wisteria Wonder card base. I sponged around the edges in Baked Brown Sugar ink using a nearly dry baby wipe. I get a much smoother sponge effect if I use a baby wipe rather than a sponge. On the very vanilla piece, I inked up the script stamp from the Background Builders stamp set — I love this set. I first inked it up with the Wisteria Wonder marker (I don’t actually own a Wisteria Wonder ink pad), then blotted off some of the ink by tapping the stamp a few times with a baby wipe. Stamped that on the bottom. Then I inked it in Wisteria Wonder again and this time didn’t blot it; stamped it. Inked the stamp again with my So Saffron ink pad; stamped it. Then inked it one more time in So Saffron and this time blotted it with the baby wipe. Stamped. Then I got out my Gorgeous Grunge stamps and put a few ink spots on the paper in both Baked Brown Sugar and So Saffron ink. I distressed the edges with the Stampin’ Distress tool, then peeled the paper at the corners, then sponged Baked Brown Sugar all around the edges. 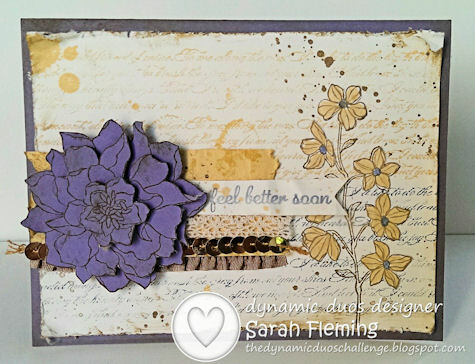 I stamped the flowers from the Peaceful Petals stamp set over the background in Baked Brown Sugar ink. Then I stamped it again on another piece of Very Vanilla paper, colored the flowers with my So Saffron and Wisteria Wonder markers, fussy-cut the flowers with my Paper Snips, and glued them down on top of the original stamp. To age the strip of So Saffron cardstock, I first wet it a little (just a little water on my fingers), crumpled it up, flattened it back out, and let it dry. After it was dry (I helped it along with my Heat Tool), I tore the edges. I glued the Baked Brown Sugar Ruffle Stretch Trim ribbon to the back of the strip so the ruffle hangs out from underneath the cardstock. Then I glued the yellow strip down to the card. Then I stamped a few So Saffron ink spots on it (overlapping the Very Vanilla background). I glued down the Gold Sequin Trim and felt a great sense of accomplishment, since I’ve tried using that trim on about fifty cards, and it just didn’t work for me before. Here it finally worked. Next I added the Crochet Trim Ribbon above the sequin trim. The big purple flower is also from Peaceful Petals. I stamped it three times in Baked Brown Sugar on Wisteria Wonder cardstock. I fussy cut the full flower the first time, then the middle layer, then the center. I used Dimensionals between the layers. 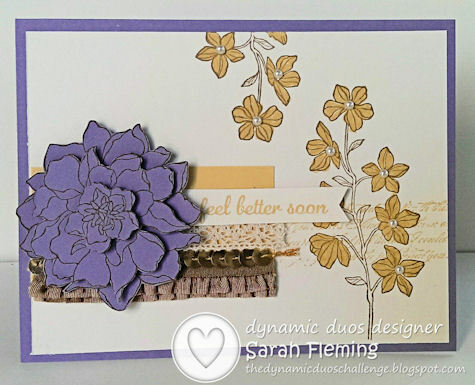 Then I added the flower to the card using Dimensionals and the Tombow Liquid Glue. I initially forgot to age the big flower, so I went back later and sponged on some Baked Brown Sugar ink. I stamped the sentiment from Express Yourself (hostess stamp set) in Wisteria Wonder on Very Vanilla cardstock, then hand-cut the banner. I got the paper a little wet (I liked that this made the ink run a little), crumpled the edges a bit, stamped some So Saffron ink spots on, and glued it to the card. And then I wrinkled up my nose and decided to remake the same card, but in my wheelhouse pretty style. For the clean, crisp card, I used the same card base, but I didn’t sponge the edges. For this card, on the Very Vanilla mat, I only stamped the script stamp once, in So Saffron. So it’s much cleaner and not quite so busy. I again stamped the flowers on the mat in Baked Brown Sugar, but instead of stamping them a second time and adding the cut flowers to the mat, I just colored the flowers directly on the mat using my So Saffron marker. I added Pearls to the centers of all the flowers for a big wow factor. Then as an afterthought, I turned the same flower stamp upside down and partially stamped it again. Colored, added pearls. This time, I glued the Ruffle Stretch Trim ribbon to the front of the yellow cardstock strip, and I added a second stretch of ribbon so I’d have two cute little ruffles. Added sequin trim, crochet ribbon. I didn’t age the purple flower this time, and for the sentiment, I stamped it in yellow for a change, flagged the ends of the banner using my Hexagon punch, and glued it down. I decided to show you both cards for two reasons. One, I showed my knitting group both cards and asked their opinions on which card I should use for the challenge — and they were split pretty evenly, though I think the clean, crisp card won out in the end. Two, I wanted to show you that you can take the same design and make it in multiple styles and come out with entirely different cards. So I hope you like at least one of the cards. 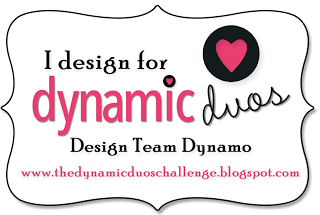 ;) And I hope you’ll head over to Dynamic Duos and see the lovely cards the design team has for you. 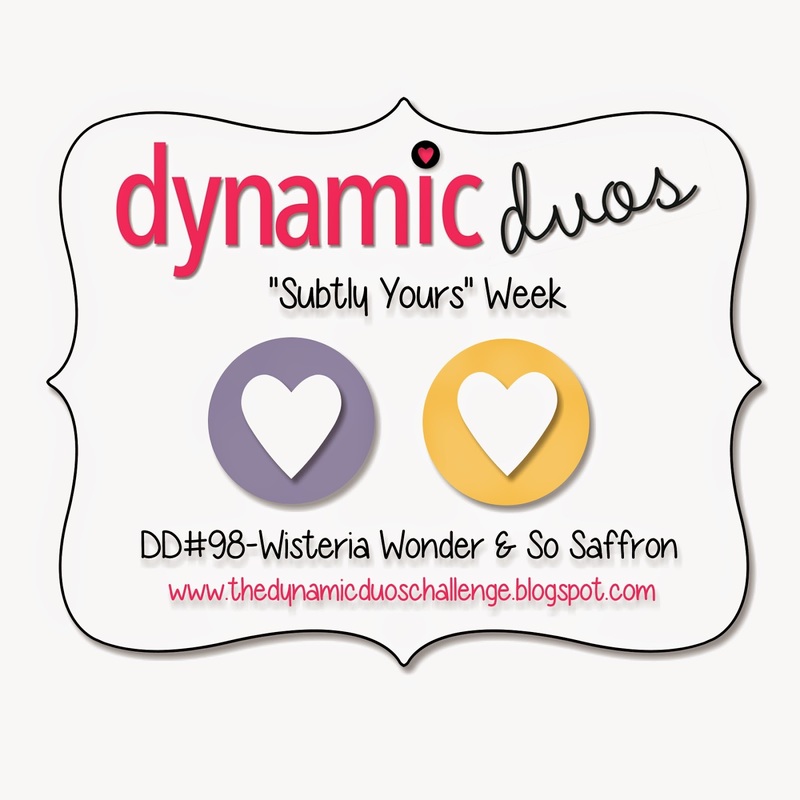 Maybe we’ll inspire you to make a card (or two) for the challenge. Sarah, you truly have a creative mind. Every week you always have such a unique layout. Love this card! The flower really pops, and I love the gold accents. Nice job girl friend! Miss Sarah, I love the second card which was your first- it is great even though you say it is not your style. (the other one is great as well) You did a great job roughing it up! Love both cards but since I tend to gravitate towards vintage, I like the second one a bit better (even if you do not :-)) Glad to hear you are all feeling a bit better and hope you have a wonderful Easter! !